▪ Florida’s execut ion of former white supremacist gang member Mark James Asay last week was the first time in modern history that the state has executed a white man for killing a black victim. Since Florida reinstated the death penalty in 1976, at least 18 black men have been executed for killing white victims there. ▪ Residents of every county in the U.S. will have access to at least one health insurance plan on the Affordable Care Act exchanges next year. Just two months ago, nearly 50 counties had no participating insurers, but state officials and federal subsidies convinced the companies to offer plans. 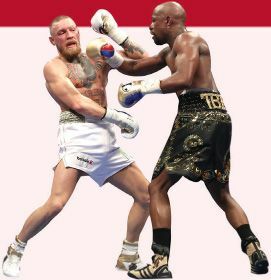 ▪ Floyd Mayweather could pocket up to $300 million from last week’s fight with UFC lightweight champion Conor McGregor, who was defeated in a 10th- round techinical knock-out. That payday— most of it from pay-per-view revenue—means that Mayweather made more in an hour than most NFL, NBA, or MLB players earned in their entire careers. McGregor will get an estimated $100 million. ▪ If the 2018 elections for the U.S. House of Representatives were held today, Democrats would get 54 percent of the total vote but just 47 percent of House seats, according to a forecast by Decision Desk HQ. Under that scenario, Republicans would keep their control of the House, with 229 seats to Democrats’ 206 seats.